“Show me just what Muhammad brought that was new and there you will find things only evil and inhuman, such as his command to spread by the sword the faith he preached,” said Pope Benedict XVI in 2006, in what became known as the Regensburg Lecture. It didn’t matter that he was quoting a 14th-century Byzantine emperor: the indignation was global. Politicians, religious leaders, journalists and scholars were united in their condemnation. Muslims rioted, churches were bombed, crosses were destroyed, effigies of Pope Benedict were burned, and a nun was killed. The fact that there is a certain epistemic tension between the quranic assertion that there is no compulsion in religion, and that Mohammed spread Islam through violence and forced conversion, got lost in the fray. Other accounts render it: “I am not speaking of a war of religions. Religions don’t want war. The others want war.” Whatever the translation variables, the assertion is unequivocal. For Pope Francis, the world is at war, but it is not a war of religion. 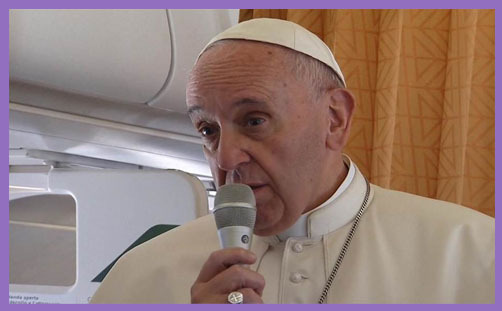 We must not be afraid to say the truth… The Pope of Rome doth err (as, incidentally, did the previous Pope of Alexandria in his response to Regensburg, namely that “any remarks which offend Islam and Muslims are against the teachings of Christ”). Has Pope Francis not heard of that strain of Islam which most definitely agitates for war? Is he not familiar with the writings of Muhammed ibn Abd al-Wahhab, the founder of that very conservative cult Wahhabism, sometimes called Salafism? Is this not a particularly virulent reformist strain of Islam? Is it not a distinctly religious pursuit, which transcends the Saudi Arabian desert and calls the Ummah to global Jihad? How is this mania not religious? In what sense are “the others who want war” not true believers in the divine vision that Allah’s sun will rise over the West? Wahhabism may be a little severe for many Muslims, but it is most definitely a corpus of Islamic doctrines, and it is undeniably a religion. When its disciples (who call themselves Muslims) encounter the fruits of the European Enlightenment and the heirs to the French Revolution, the clash is religious: women must wear the veil to show modesty and piety; the men must be vigorous in cleansing the land of infidels, including elderly priests as the celebrate Mass. Every action and attitude must conform to the application of the Sharia, as interpreted and determined by bearded men armed with cudgels. If you watch football, sing a song, or don’t pray five times a day, prepare to meet your maker. If you have the misfortune to be raped, you’ll be flogged, hanged, stoned or beheaded. If you’re gay, you’ll be hurled off a tall building. If you steal a loaf of bread, you’ll lose a hand or foot in the public square. These macabre spectacles are Allah’s injunctions: they are what Mohammed himself would want. There is no room for protest: no conscience may be pricked with revulsion. That way lies heresy. Wahhabi Islam – Saudi Salafism – seeks robust solutions to the ills and woes of contemporary society, and its method is the literal implementation of the most abhorrent words in the cruelest sections of a sacred text. We are concerned with the validity of the revelation of the Qur’an and with the sacrosanct prophethood of Mohammed and his paradigmatic sayings as recorded in the Hadith. And so our subject is Islam. Since Wahhabists invoke Mohammed’s attitudes and actions to justify their extreme acts of hatred against infidels and the vilest denunciations of apostates, it is wrong and dangerous of Pope Francis to say that those we now call Islamists are not concerned with religion. Their fanaticism is inspired by the jihad of their prophet: they are in a state of perpetual war against unbelief, and so the unbeliever must be put to the sword. Yes, Pope Francis is absolutely right that their motives are mingled with “interests, money, resources”; the ancient Bedouin tribes had to stave off starvation somehow, so land and lucre were wrapped up in their zealotry. But Saudi-Salafists believe they serve Allah: their prophet is a pearl of great price; their jihad is holy; their brotherhood a rigorous community of religious austerity dedicated to the reform of Islam. It helps no-one and solves nothing to pretend that Islamist belligerence is merely political and material. If Christian religious leaders refuse to grapple with the acutely religious inspiration for the systematic murder of Jews, Christians, apostate Muslims and polytheists, and their complete eradication from the Middle East, we will wake up one day to find ourselves Islamised by the retrograde voices of unbridled indoctrination, with Wahhabists dancing over the tombstones of liberal democracy, and an unimaginable Mecca established in our midst.